Athlete Spotlight: Assistant Manager Carlos A. What is your current role with Enterprise? How did you hear about Enterprise as an employer and what made you decide to apply? Actually, a friend I swam with– Carlos A. – told me about Enterprise and the Management Training position. He retired from swimming earlier than I did and he was having such a great experience that I decided to apply once I was done with my swimmer career. Tell us about your career path with Enterprise. So far it has been great! I started about in early 2016 and it’s getting really exciting! I’m about to be able to be promoted. 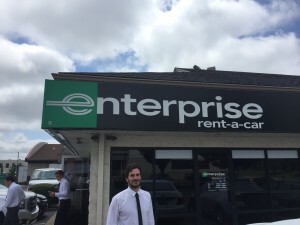 I started in a smaller Enterprise branch in our Kentucky operations and now I’m working at the largest branch in the state – which is a whole different beast! But it has been a fantastic experience so far! What do you like most about your career with Enterprise? My co-workers and the work environment! And of course the great advancement opportunities! How have athletics prepared you for your career with Enterprise? The hard training schedule and competing at such high level molded me and made me a very efficient worker. Are you still training professionally for any athletic events? Are you scheduled to participate in any upcoming events? No, I used to train 10 sessions a week in the water 2 hours each, plus 3 sessions of weight training. Training was a full time job on its own! I competed in 2008 and 2012 in the sport of swimming for my country, Portugal. My events were the 200 butterfly and the 200 backstroke. Until today I still hold the national record for both these events and I was consistently ranked in the world top 16. My experience was absolutely fantastic. A lifetime dream accomplished!